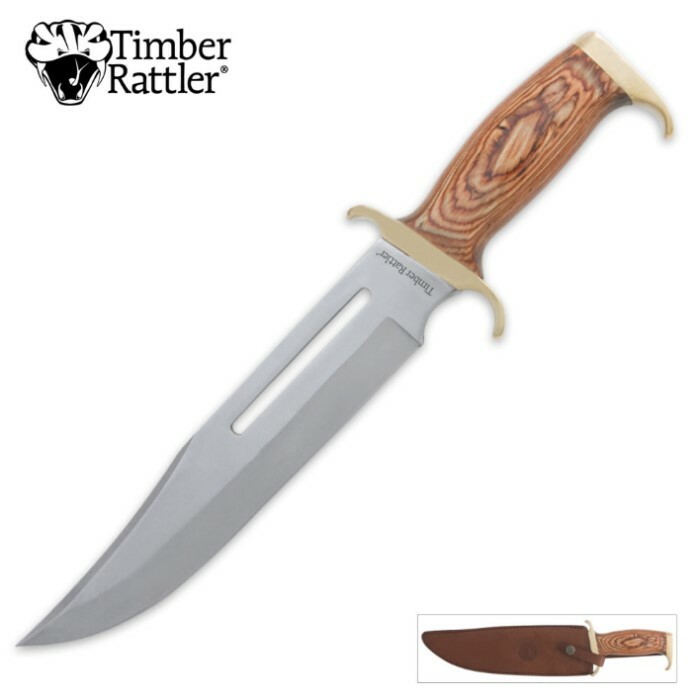 Timber Rattler Jungle Fury Bowie | BUDK.com - Knives & Swords At The Lowest Prices! 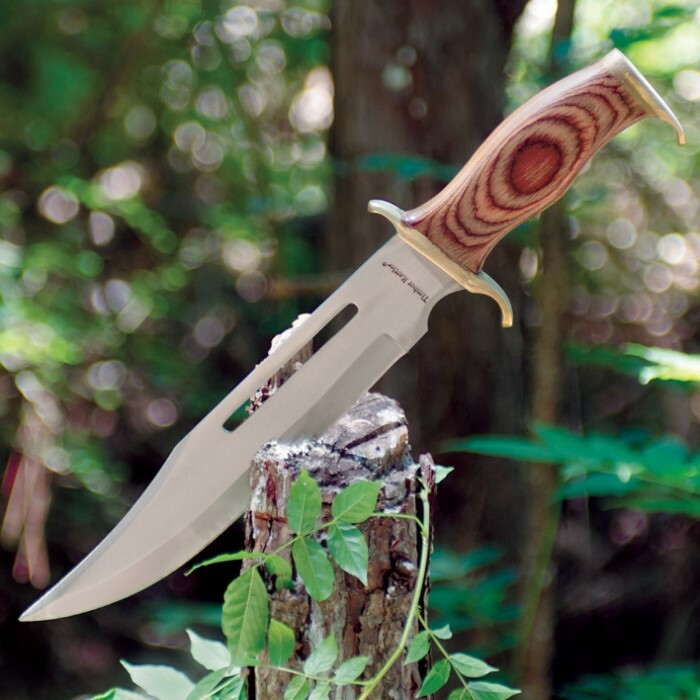 Almost a short sword at 15.5" overall; this is a great Bowie knife for a spectacular price. Very well made. Great knife for the price better quality than expected for the price would recommend to others. I realize it's a 15 dollar knife. Upon further inspection, I found a lop sided blade grind ,stains on tge brass ,and a small chunk out of the blade window. A bit more quality control would go a long way. I bought this for a friend and I absolutely fell in love with it. What a great feel and balance. Love this knife for the price. Plus, my friend was ecstatic. Overall, this knife is a winning combo of price and style. Nice huge knife, and great value. Could have been sharper, will let my nephew learn how to sharpen knifes. 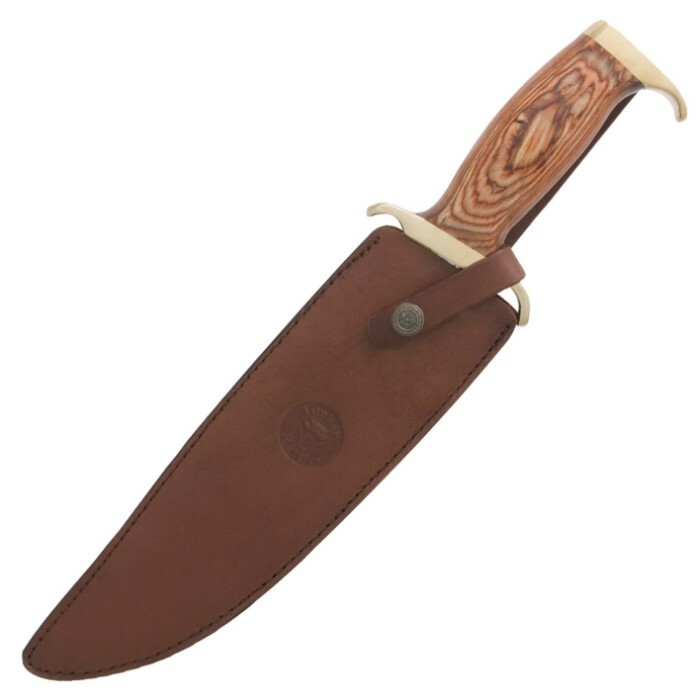 Overall good quality, especially leather sheath. Used it to chop down tree, for around $10 bucks not worried about damage. Great blade.... But it fell apart after the 5th wack on a log.....!!!! The Pakistani blade is great, but that's it. So instead of returning it to BK. I found a solution. So since the blade was good and the handle was junk. I modified it.!! So I remove the pommel and replace it with a nut, with the same thread pattern. Then I put the pommel back in place using Gorilla glue, as it is just for looks.. And then I drilled a hole for a lanyard. Now this sword will chop through a 3'' branches....NO PROBLEM...!!!¡!! Worth buying, but needs to be modified.